BESIDE BOWIE THE MICK RONSON STORY is a great film. It’s one of those rare films that confounds expectations and reveals itself to be what you expected and yet something else entirely – something more wonderful. Nominally the film is the story of Mick Ronson the man who was next to David Bowie during a large part of his career, the film tells the march larger tale of the creation of a sound and the superstar image that was Bowie. This is the story of music that would shape a huge chunk of the music that followed in next 50 years. For those who don’t know Ronson was brought in to work with Bowie during the Man Who Sold The World days. He was working as a gardener but had developed a reputation as a master guitarist while working in several bands such as The Rats in Hull. Bowie needed a guitarist so a mutual friend went to see Mick and sent him to Bowie. From the minute Ronson began tuning his guitar for Bowie his future was set because it was clear just from his warm up that it would have been insane to let him go. Bowie literally put him to work immediately rehearsing with him for a couple of hours before they went on the John Peel radio show. The rest is rock and roll history. A deceptively simple story told, by everyone involved (including Bowie in recorded voice over and Ronson in archival footage), the film is a "you are there" tale. Little is off limits. This is everyone talking about what happened in a manner that makes us feel that we are getting let in on some big secret. Every one dishes and strives to set the record straight as far as they know it. It’s so expertly put together that even where I was listening to stories I knew I still felt like I was learning something new. It is film that lets everyone know just who Ronson was and how important he was to Bowie and to music in general. What I loved was that while the film feels to be heavily focused on Bowie at the start, to the point for a bit it makes you wonder who the film is about, the film slowly shifts into being about Ronson. Yes Bowie is front and center for most of the film, but Ronson is always there as well. He is a kind of man behind the curtain, arranging and performing. You realize how Ronson was working like the devil to make the music happen so Bowie could soar. As the film progresses we understand how Bowie may have been the frontman but he may not have been the mega star without Mick -since he was the guy making sure the music was right. We also understand how o many other people turned to Mick to help make their music. I can't tell you how much this is a great film- you'll just have to see it. If you want an indication about how good this film all you need know is that I started watching the screening copy of the film I was given just to see how it was and instantly I fell into it. I kept watching it all the way to the end without my notebook, so I ended up taking notes on the film on everything that was at hand, the mail, napkins, my hand, newspapers…. And then when it ended I just sat there and said Wow. When I finished “Wowing” I tried to put my notes together and found I really couldn’t. Part of the problem was I had notes everywhere except the walls, most of the problem was there was simply too much to discuss, from Ronson clicking with Bowie, to his solos albums, to the discussion of how the Bowie legend was created out of smoke and mirrors, to Ronson's ability to orchestrate and on and on. I don’t know what else to say other than go see this. 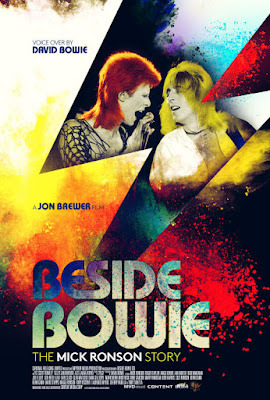 If you love Bowie, if you love rock and roll this film is a must.